Day 359: Drive for Dough, Putt for Show . . . So, as you may recall – Jean played golf on Friday and had a wonderful time and a couple of pretty decent shots during the round – her team didn’t win, but had a wonderful time. Not that she and her sister Sara are the least bit competitive when it comes to the links, but . . . Jean now stands in awe of six year younger sister for her incredible feat today. You see, Sara in a very gifted athlete – she’s ridden the MS150 numerous times, has been known bowl a 300 game and today accomplished a feat that few people do once, least of all twice in one day. While on a business trip to Denver, Sara took up her clubs and hit the course and proceeded to shoot a 50 on 18 holes . . . made possible by TWO, yes . . . count ’em TWO Holes In One! Come on now – that just doesn’t happen. We’ve checked the record books and can’t find any comparison to this feat. Upon reading the news on Facebook, we had to know the details – but Sara didn’t answer her phone. What was her secret? A new club – some new super charged golf balls – has she been secretly taking something to improve her strength and accuracy (don’t think she knows A-Rod) . . . what could it be? Perhaps the altitude in Denver makes the difference – we’ve heard that on a humid night a baseball actually travels farther than on a cold night . . maybe it’s something like that or she had the wind at her back (there is a bit of Irish on Jean’s side of the family) . . . Regardless of the who, what, when, where and how – we ARE impressed. Yep, tonight Sara took home the crown! Job well done – Jean is super jealous! To celebrate this feat, we opened a wine from Sara’s neck of the woods – a 2010 Stone Cap Estate Grown Cabernet Sauvignon from Columbia Valley. . .as in Washington. We know we need to make a trek out that way for a visit and will be sure to make this winery a stop on the tour. The wine comes from Goose Ridge Estate Vineyard which is located on the ridge of Goose Hill, across from Red Mountain in the Columbia Valley where the Yakima River converges with Red Mountain and Horse Heaven Hills. The vineyard has gentle, south-facing slopes and warm temperatures. The Monson Family planted the vineyard in small blocks to produce high quality estate-grown wines. The 1,600 acre vineyard is planted to Cabernet Sauvignon, Merlot, Chardonnay, Riesling, Viognier, and Pinot Gris. Upon opening the wine, we loved what was on the nose. An amazing fragrance of dark fruit and a floral. On the palate, we were excited to find a full-bodied wine with black cherry, raspberry and currants that combine with toasty oak, chocolate and spice. According to the wine maker, grilled pepper steak or herb-roasted rack of lamb are favorites with this smooth and powerful wine; however, we opted for a spice mix of kung pao chicken and steamed white rice. A terrific combination that highlighted the sweeter notes of the wine as well as the deep structure. It’s yet another example of food and wine working very well together! At around $8 bucks a bottle, you’ll think you’re enjoying something far more sophisticated, but you’ll love how little the cost is compared to the flavor! We’ll definitely add this wine to our list of deck wines to be enjoyed on a moment’s notice. So, back to the golf game. We are still in shock and awe! Two holes-in-one. . .on the SAME DAY and the SAME COURSE! Even the guys on the PGA Tour can’t muster this kind of performance. Finally got an update – it seems that Sara might have had some assistance from a guy named Don Quixote on the Windmill hole – but other than that . . . she gets full credit for her feat tonight! Quick reminder – please continue to send in your votes for the Top Ten Bondy Deck Wine list – time is getting short until Day 365! As always, please remember to enjoy responsibly and recycle whenever possible. 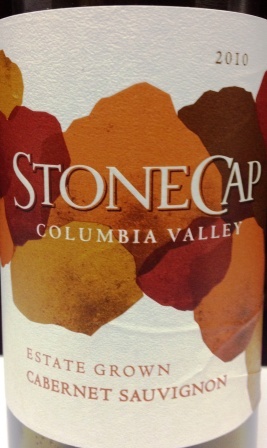 Categories: Uncategorized | Tags: Columbia Valley, Don Quixote, golf, Goose Ridge Estate Vineyard, Sara, Stone Cap, Stone Cap Cabernet | Permalink.